Mario Maker is a fantastic package! You can create, share and play levels created by other makers in 4 of the Mario game templates. Creating levels in Course Maker is both intuitive and entertaining, with tons of visual and aural feedback, that make the often dull process of level creation fun. I only purchased the game a few days ago and already I’ve sunk many hours into it; including fast forwarding my system clock a day at a time to unlock all the level creation tools as fast as possible! To note, it normally takes a whole week to unlock all the tools and templates. I’ve played many of the pre-built levels, as well as other users’ creations in Course World. One thing I’ve noticed having played dozens of levels now is that… none of these levels are very good. At least, not in the traditional sense of what makes a “good” Mario level. There are some highly creative levels that are both entertaining to experience, as well as levels that will put your platforming skills (and patience) to the ultimate test. But none of these levels would have made it into a Mario game; not even into the Tubular and Gnarly levels that made up Star Road of Super Mario World. I don’t think this is a limit of the Maker. From what I’ve seen of the tools provided, everything is there to make a great Mario level. So why aren’t there more? The game has only been out not even two weeks at the time this post was written. Users are still experimenting with what can be done in the game. Even though the game has many of the classic Mario elements, there’s also new dynamics that have been introduced that were not seen in previous Mario games. This is part of what makes creating levels in Mario Maker so fun; the element of experimentation. If I drag Wings onto a Cheep Cheep, will it fly? Now, what if I take that flying Cheep Cheep and put it into a cannon? And then put that cannon into the Koopa Clown Car? All these things are possible and very easy to quickly test, which means you can make some INSANE Mario levels. The best part is these components work between all 4 Mario games. Many of the elements of the later Mario games have retroactively been added to the earlier Mario games. This, of course, is easily abused to create situations like the one shown in the screenshot above. These levels can be fun (and surprising) but often lack good design principles seen in most commercial platformers. Many of the levels being featured right now are levels that either have a huge “Wow!” factor (like the automatic levels), levels with an interesting gimmick (like the “don’t touch the shrooms” level), levels that are designed like other games (the Sonic and Metroid levels for instance), and of course, the Kaizo Mario style levels. None of these types of levels adhere to good game design principles. 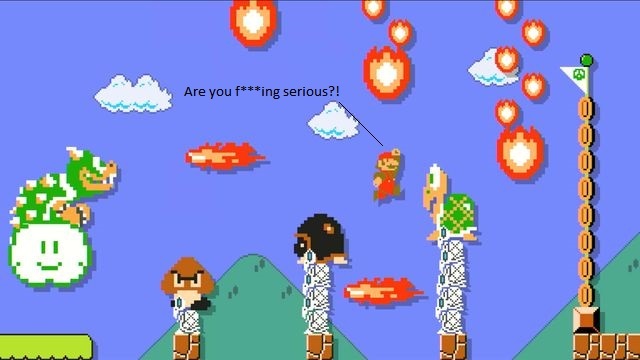 I don’t think it is necessarily a bad thing; but it gets frustrating when you want to play a REAL Mario level. Level design is an art form. Just like observing great art at a gallery won’t make you a great artist, playing great Mario levels won’t make you a great level designer. Certainly playing these levels with a critical eye will go a long way, and I think there are some pre-built levels that give you a good basis to work with. But, in the end, it comes down to practice. There are probably not too many professional level designers creating levels in Mario Maker yet. 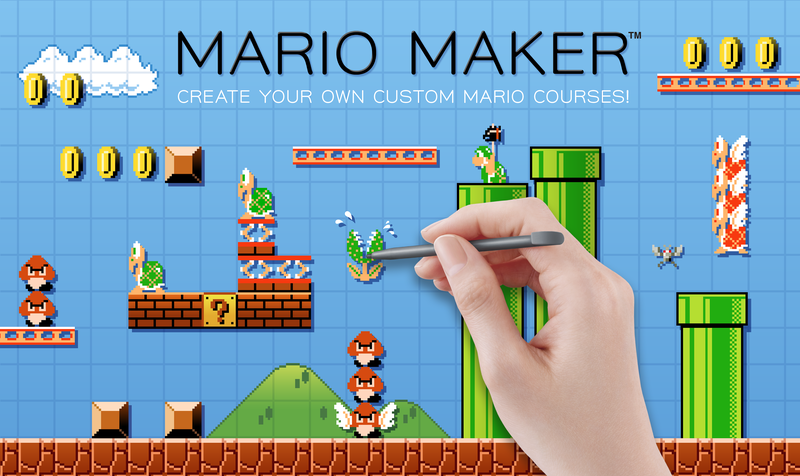 Most that own Mario Maker are the general consumer, who like to play games but don’t create games themselves. Most of them will mess around in the Maker and have a fun time making crazy levels to torture their friends; but my hope is that the remaining few will stick with it. And after they get through their “experimental phase”, they’ll attempt crafting real Mario levels. This is a great tool for budding designers as well as experienced ones. I would highly recommend Mario Maker to those who plan on designing a platformer some day. It’s better than any course or book you could read on the subject of 2D platformer level design. Well, I’ve gone on long enough. I’d like to hear what you think. Do you prefer the non-orthodox Mario levels or would you rather see more authentic Mario levels topping the charts? Perhaps a mix of the two? Please sound off in the comments! Also, if you have any levels you’d like to share, please leave your course ID. I’d be glad to play your level and leave feedback!